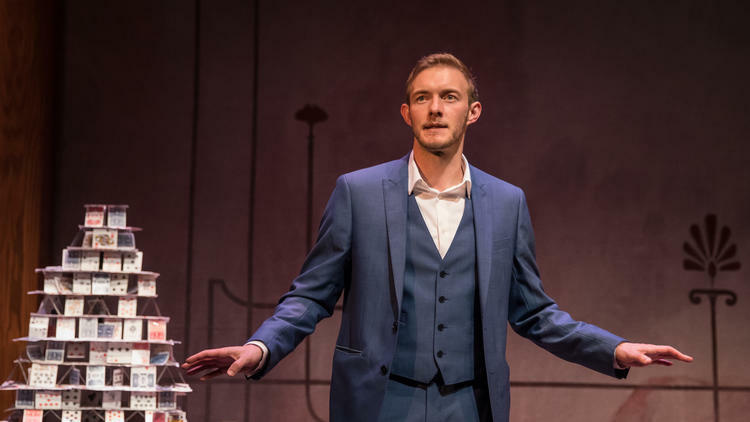 The Goodman Theatre presents the World Premiere of THE MAGIC PLAY. The press release describes this show as ‘part magic show, part play.’ And that combination gives it an authentic feel. It certainly starts out like a magic show. The charismatic Brett Schneider (magician) takes the stage and immediately amazes the audience with card tricks. Schneider jovially banters directly to the audience. A projector showcases him dealing out illusions on a card table. As we settle in for the entertaining magic show, Sean Parris (diver) appears behind the transparent curtain on a diving board. The poetic visual causes Schneider to fumble in his otherwise slick delivery. As Schneider continues to work the crowd, he relives meeting the charming Parris during one of his shows. We begin to witness the smoke and mirrors the magician hides behind in his real life. 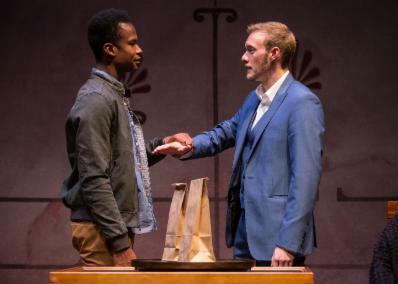 Playwright Andrew Hinderaker cleverly pens a magician’s struggle to keep it real. He forces Schneider to confront his deceptions off-the-stage. Director Halena Kays skillfully layers this in illusion and realism. Schneider is a showman even in his relationship with Parris. When Parris questions Schneider’s honesty, the rabbit is out of the hat. We experience the disconnect. The action feels more genuine than a magic show in a play. It seems like we’ve gone behind the curtain of the magic show to observe real life in real time. This reality illusion continues into Act 2 as we observe another magic show performed by the resigned Francis Guinan (father). It’s old school. The tricks have a vaudeville quality. Guinan jests about the buffet in the basement. Guinan selects a volunteer from the audience. It’s Schneider! The magic diminishes as drama takes center stage. 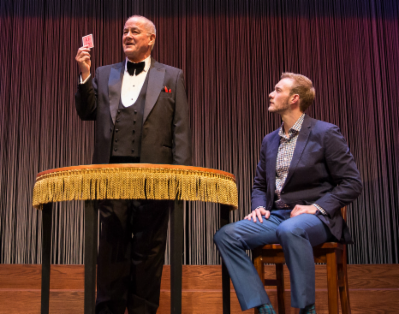 THE MAGIC PLAY thrills in its mystifying feats. Later, when Schneider actually debunks a card trick for Parris to build trust, the reality is disappointing. I want the magic over the humanity. I want to believe Schneider is a sorcerer. I want the illusion love conquers all. THE MAGIC PLAY is more real than fantasy. And that makes it an interesting play but a disenchanting magic show. Running time: 2 hours includes an intermission.